School of Fear. One of the most terrifying places you could have ever been. Deep, deep fear will lurk inside you if you go there to face your fears in the most horrific way. Theo, Garrison, Madeline, and Lulu have the biggest fear of four different things; death, water, bugs and small spaces. Their biggest fears. They need all the help they can get. Everyone believes that only School of Fear can do the trick. 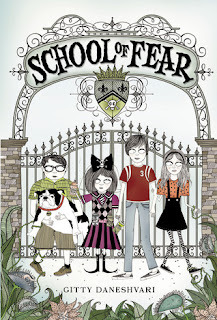 This book was a very interesting book not only about how the four recover their fears, but how they save School of Fear. The School of Fear is located at the top of one of the tallest mountains in New England, hidden from anybody that comes their way. Day and night it is invisible to all other living things. I believe that the School of Fear is one of the most terrifying places to go, but also one of the best places to go. I think this because you can recover your fear in billions and billions of odd ways, but you still do it. I would definitely recommend this to a teacher so she/he could read it to their students. The reason I would do this is because when I was in fifth grade, my teacher would always have some of the BEST books in the world to read to our class that would make me never want to go to lunch because I didn't want her to stop. And I LOVE food!!! I felt like this book would be one of those kind of books that you wouldn't want to put down! I can make a connection to this book because when my two friends were going to a non IB school they thought that I was going to some weird school that made me gifted and special and them normal. I think that an IB school is a well taught school that wants their students to exceed so I didn't listen to them. This book is very detailed but in the best ways possible! I LOVED this book !!!!!! Great review. Sounds like a cool book.